It must be said that this was a Magnetic Fields show like no other. If anyone is familiar with the band live, Merritt usually takes his place stage left or right. Not tonight. He was front and center, no matter how uncomfortable it may have made him feel. Given that the album is all songs inspired by this first 50 years on this planet, for this time only, he was the lead vocalist on each and every song, though in this live setting, Shirley Simms backing vocals were mixed high enough to count almost as a duet on some tracks. With the normally reticent Merritt being the focus onstage, the design of the stage and presentation became far more crucial to the event than any of the other three concerts I have seen by the band. To the point where the staging and multimedia that accompanied each song within the large suspended oval screen above the stage helped to not only illuminate the themes of the songs, but to also act as misdirection; insuring that Merritt did not have eyes on him at all times. 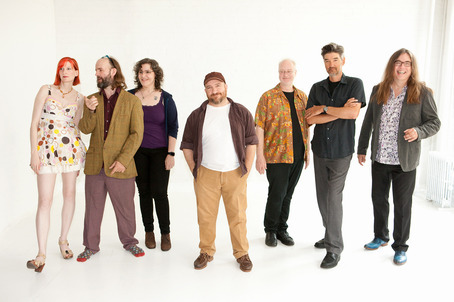 After all, in the liner notes and lyrics to the song “The 1989 Musical Marching Zoo,” Merritt admitted that he wanted The Magnetic Fields to be completely anonymous, with no photos of the band reaching our eyes for years. I had to admit, that one of my favorite things is a band that has more than a single lead singer, and this night vocalist Claudia Gonson was not on stage. of course, she manages The Magnetic Fields, and with the scope of this presentation, she probably had her hands quite full. Seven musicians on a stage loaded with sets and props [note: this never happens] and ultimately, she only sang backing vocals on the album itself, so it fell to Shirley Simms to add vocal diversity to the concerts. In the live setting, she was mixed quite a bit more prominently than on the album itself, which I had purchased in advance of setting out for the show. The new material was already feeling like an old friend even though we only had a chance to listen to the first three discs of the album on the road before the concerts. Merritt’s sardonic wit knows few equals, and there were many memorable ideas expressed within the project. Merritt’s songs usually evoke his persona, but this time the inclusion of obviously personal details, drove the point home further than usual. When the set the first night came to the song for 1983, my wife and I had to whistle and applaud, for it was the John Foxx homage “Foxx And I” and for a minute or two before the song commenced, Stephin Merritt explained who John Foxx was for the other 900 people int the full auditorium who probably had no clue at all [sigh]. Still, seeing a projected image of Foxx was the closest I’d ever come to the man himself on a stage. I’m happy to take whatever cheap thrills I can get at this age. This was another manifestation of what made this tour unique since Merritt tended to speak quite a bit between many numbers; either setting up the songs straightforwardly with backstory or else leading the audience down an ironically apocryphal rabbit hole of sorts. One thing that I immediately noticed the first night, when perusing the program, was that Christopher Ewen, Merrit’s long-standing collaborator in Future Bible Heroes and various Magnetic Fields tours was in concert for the show. Longtime readers may recall that Mr. Ewen weighed in a few years back when we were discussing his band from the 80s, Figures On A Beach. I ended up sending a CD of the music in question to the gent and I wondered if I’d have a chance to meet and speak with him. The odds were long, I felt, so I didn’t think about it overmuch. Other stalwart players like Shirley Simms and cellist/guitarist Sam Devol were familiar figures even as violinist Pinky Weitzman seemed fresh faces to me. Our seats the second night we were in the orchestra pit so we experienced the show from two radically different perspectives. It was good seeing the show from both perspectives as the first night was halfway back in the theatre. A highlight of the second night was the hilarious tune “Surfin'” which was a mock surf-tune which roundly mocked the very notion of surfing in the most caustic way possible. We had not yet gotten to that disc in the album yet, so it was a surprising debut to our ears. One could not help but laugh uproariously, even though I am a real lover of surf music, if not the activity. The shows also contained a “seventeen minute” intermission at each night’s midpoint, where the band returned to the stage in different garb. The entire show was as civil and sophisticated as most rock concerts are decidedly not.The audacity of an act performing their entire new album is something one rarely encounters, but this pair of shows encompassing fifty new songs, full of the emotions and wordplay as well as the hooks and melodies that we love The Magnetic Fields for made this concert extra special and a real pleasure to attend. The second night my friends were hitting the merch table when my wife and I waited for them by the exit doors. Looking outside, I was flabbergasted to see Chris Ewen chatting with a couple just 20 feet away, so with that I told my wife “hey, there’s Chris Ewen, I’d better go say hello” and we went outside in he chilly air to do just that. I introduced myself under my name as well as PPM as we shook hands. Chris thanked me once again for setting him up with the Figures On A Beach CD back in 2014 and we chatted for a bit, enthusing about the shows we had just seen. I also dropped DJ Taffy’s name since he’s one of Ewen’s Bostonian friends. Anyone who follows the comments here would recognize his moniker. I told Mr. Ewen that he was the first musician who I had ever given one of my CDs to, and then we headed out as he had gear to break down and we were getting rather cold. The current Magnetic Fields tour was a decidedly different beast to all of the other concerts we’d previously seen by the band. The changes in form and content are substantial enough for anyone who is a fan of the group to make the effort to see the full show as it imparted huge amounts of novelty to the proceedings. The band are about halfway through their US leg, with more to follow soon before trodding the boards in Europe later this year. There will probably never be anything of this scope mounted by the group again, so do think twice before missing this, there’s no other word for it, extravaganza. 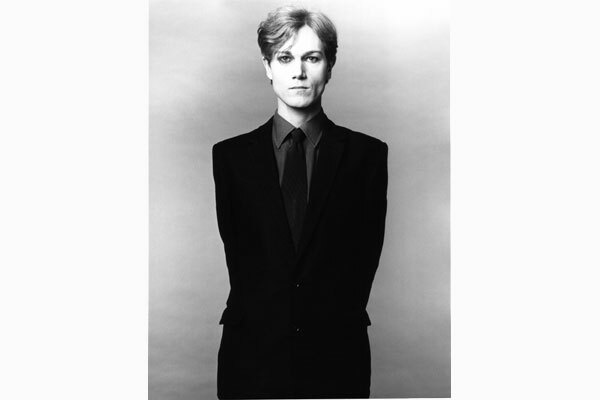 This entry was posted in Record Review and tagged 2017, John Foxx, Live Concerts, Magnetic Fields. Bookmark the permalink. Very envious of you! I have not managed to get MF in our neck of the woods, though I am determined to hit the Seattle show as I know the Moore Theatre to be a great place for a concert (I saw Joe Jackson’s “The Duke” tour there). What I have heard of this new album sounds great — Stephen is one of those rare artists who’s entire output is enjoyable with only rare and minor missteps for what in the main are glorious and yet somehow highly consistent works. Very glad to hear that Mr. Ewen got to meet you in person! Sounds like a great show and I can’t wait to see it myself. Color me jealous, as I am forced to miss the Boston dates. Chris Ewen is indeed a pal and a lovely man; his local DJ nights in Boston are legendary. I finally obtained a copy of 50 Song Memoir and look forward to spending many hours with it! Taffy – Ah, a DJ’s work is never done, is it? I knew that would probably hurt, but there’s no way to sugarcoat the truth. This is a unique tour for TMF. The album is another pithy collection of great songs. Lots of the diversity we’ve come to expect with the exception of the vocals. 50 songs of Merritt’s baritone crooning (as good as it’s gotten) is actually a bit much for listening in one fell swoop. We stopped listening to the album on the trip about half way through. I’ve been listening to it this week on my commute. Conversely, the show, with its pacing and presentation, adroitly sidesteps that limitation. I never felt “where’s Claudia” in the live setting, though Shirley and the band member’s vocals were featured more live than on disc.